Visit the CSU Accessibility Technology Initiative (ATI) site and CSYou site for a wealth of Web accessibility information (e.g., guidance and process templates; authoring and captioning resources to create accessible content - and much more). Visit the Cal Poly Drupal site for more information on getting started, FAQ and tutorials. Increase your awareness, strengthen your skills, and learn how to get involved. Learn how Cal Poly is mobilizing to improve accessibility of procurement in support of the CSU Accessible Technology Initiative (ATI). 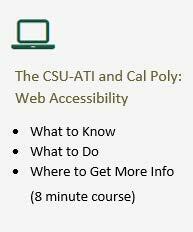 Coming January 2019 - Cal Poly Accessible Technology Initiative (ATI) "Wiki"
As the official CSU-ATI site, you'll find a wealth of accessibility information for procurement, Web and instructional materials accessibility. Be sure to sign up for the CSU-ATI "Communities of Practice" to receive updates, meeting agendas/minutes and much more. Participation in monthly meetings is highly recommended. Cal Poly Employee and Organization Development "Accessibility Toolkit" - Visit this site for a wide variety of online resources (e.g., Lynda.com, Skillsoft "SumTotal", Safari books, and more).